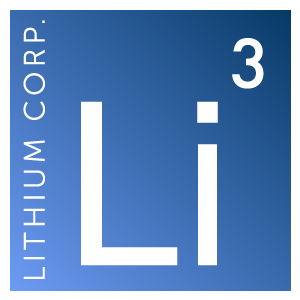 Elko, Nevada – October 3, 2016 – Lithium Corporation [OTCQB – LTUM] “the Company”, is pleased to announce that it has jointly staked with Idaho North Resources Inc. [OTC – IDAH] a block of claims on the Gabbs Valley playa in Mineral County Nevada totaling approximately 4,790 acres. The property is 54 kilometers to the Northeast of Hawthorne, the county seat of Mineral County, Nevada. Infrastructure is excellent in the area, with roads and power nearby. The geologic setting of the Big Lithium prospect is quite similar to that of Albemarle’s Silver Peak lithium brine operation in Clayton Valley, Nevada. The property is located in the Walker Lane structural belt within the Great Basin. It is in close proximity to the Rawhide caldera, a center of Miocene era extrusive volcanism, of generally more lithium rich felsic volcanics. Geothermal activity is present along the periphery of the playa as exhibited by the Rawhide Hot Springs located just outside the claim boundary. Exploratory sediment sampling of the playa was conducted in 2010 & 2011, and several samples taken within the claim area returned anomalous values in Lithium. The highest value of 720 ppm Li was taken in the vicinity of the interpreted junction of structural features that are similar to those that give rise to the subsurface lithium-in-brine deposit currently being exploited at Silver Peak in Esmeralda County, 135 kilometers to the southeast.